Change is a process that is dynamic and keeps on being applied within organizations. 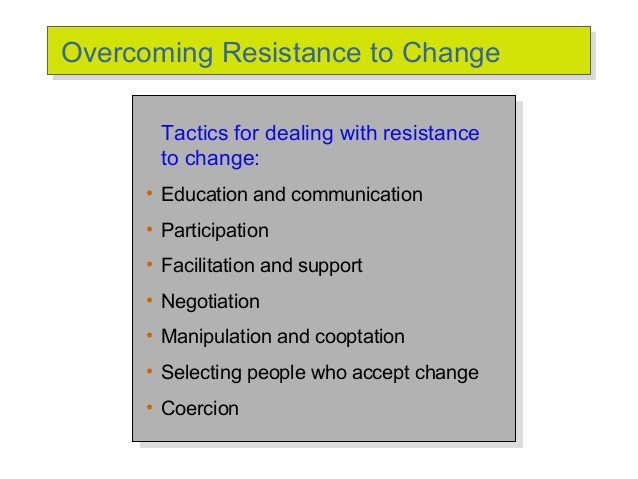 However, the major challenge facing the application of change is resistance. There exist many reasons for which people resist change and disrupt the processes and performance of the organization. Fearing the unknown is a common reason people are opposed to change. Changes in production and operations make people fear moving forward as they barely understand the risks involved. In addition to this, when changes are introduced, people feel they are incompetent on the basis of the new requirements and they oppose the change. When the reason for the change is unclear, people misunderstand its need for adoption and implementation (Cummings & Worley, 2005). For example, since a majority of the employees are not consulted to inculcate changes in the organization and the move is usually a managerial process, they misunderstand its need and result in opposing its introduction. People in an organization are used to doing things in a particular manner. The process of accomplishing activities in an organization creates an organizational culture. It is through this culture that people feel connected to the firm and built confidence and trust. When an external force interferes with the operations of the individuals such as the introduction of change, the most logical reaction is a reaction to the change. People further feel undervalued when they have to relearn new approaches to solving problems and implementing solutions (Coch & French, 1948). They are more prone to feeling that the organization is undervaluing them, and this is a primary cause of resistance. Furthermore, people evaluate the benefits and rewards involved after the change. Where the merits do not surpass the trouble of adopting the change, individuals will be opposed to the change as opposed to blindly accepting the change to dictate their processes and performance. The management must ensure that resistance to change is curbed effectively to guarantee the success of the organization. One approach to achieving this is through the formulation of an effective communication channel. It is paramount to note that a majority of individuals are opposed to change since they are not informed prior to the enactment and adoption of the change. In this regard, the management should clarify the change to be implemented and when it will be effective (Cummings & Worley, 2005). In addition, the communication should explain the aims of the change and eliminate any misunderstanding that the employees may have regarding the change. The Proper communication further enables the organization to define the need for the change in moving the firm forward towards its strategic objectives. 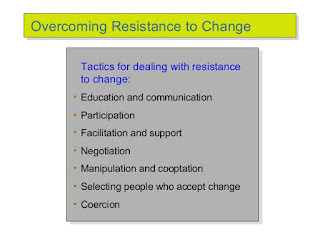 Employee participation in change formulation is essential to ensuring that resistance is kept to a minimum and eventually eradicated (Coch & French, 1948). The management should be ready to incorporate the ideas and hear the grievances of employees from various departments. Through inviting team members to participate in meetings that formulate the change the needs of different departments may be addressed and catered for in the change. Using this approach, a majority of employees will feel that appreciated and as members of the organization involved in running the daily activities of the firm. Where the people are involved, they have a little tendency of opposing the same change that they proposed. Lastly, it is essential to understand the cause of the resistance in order to formulate means and policies to eliminate the resistance. For example, in some organization, the resistance is an incitement from other co-workers who are opposed to the management and feel they should be the people in leadership. If this are the cause of the resistance, quick and stern actions need to be taken as such individuals pose a threat to the development and performance of the business. Cummings, T., & Worley, C. (2005). Organization development and change. Mason, Ohio: Thomson/South-Western.